Citizens of Limerick, Waterford and Cork will be asked for their views about being able to directly elect the mayors of their cities and counties in a plebiscite to be held on 24 May next, the same day as local and European elections. A public information campaign lead by the committee to oversee the plebiscite, headed by former High Court judge Henry Abbott, got under way today as the committee visited all three cities. 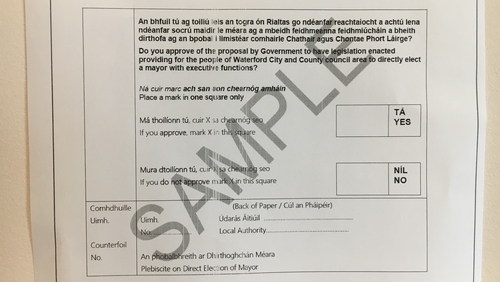 Each household in the three local authority areas will receive a guide to the plebiscite, a dedicated website 'www.mayors.gov.ie' has been set up, there will be an advertising campaign, as well as a series of public meetings to give as much information to people in advance of the vote. The directly elected mayors will have considerably more powers than those currently elected by each council each year. Those directly elected can hold office for five years and serve a maximum of two terms. They will be responsible for a significant amount of the executive functions currently held by the city and county chief executives. They must also prepare and oversee a programme of office, a corporate plan and an annual service delivery plan. Under the Government proposals the new mayor would receive a salary of €130,000 a year given the extended executive powers and responsibilities and can also appoint two advisors. The costs of running the offices of directly elected mayors could be between €313,000 and €450,000 annually. In the guide for voters published today, the committee points out advantages and disadvantages of having a directly elected mayor. Among the possible advantages are having a mayor who is directly and democratically accountable to the people of each city and county, it would increase debate and awareness of local government policy, and they could advocate for increased functions for the city and county councils. Among the disadvantages listed are a single elected individual and their office having increased powers, that it may have a negative impact on the powers of the council, and it would mean increased costs. If the plebiscites are passed, the Minister for Housing will bring a report to the Dàil within two years where the proposal will be debated, but it is unlikely there will be any vote in the three cities before 2022. If the plebiscites are defeated, the status quo remains.